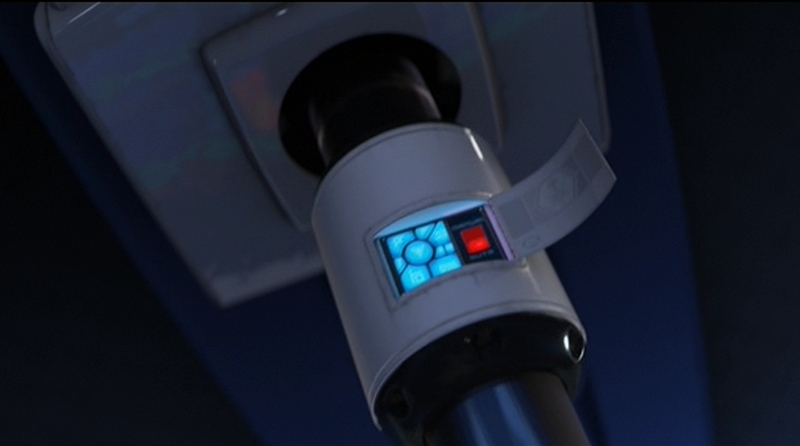 The prior posts discussed the Star Trek combadge and the Minority Report forearm-comm. In the same of completeness, there are other wearable communications in the survey. In Gattaca, Vincent and his brother Anton use wrist telephony. These are notable for their push-while-talking activation. Though it’s a pain for long conversations, it’s certainly a clear social signal that a microphone is on, it telegraphs the status of the speaker, and would make it somewhat difficult to accidentally activate. In the Firefly episode “Trash”, the one-shot character Durran summons the police by pressing the side of a ring he wears on his finger. Though this exact mechanism is not given screen time, it has some challenging constraints. It’s a panic button and meant to be hidden-in-plain-sight most of the time. This is how it’s social. How does he avoid accidental activation? There could be some complicated tap or gesture, but I’d design it to require contact from the thumb for some duration, say three seconds. This would prevent accidental activation most of the time, and still not draw attention to itself. Adding an increasingly intense haptic feedback after a second of hold would confirm the process in intended activations and signal him to move his thumbs in unintended activations. In Back to the Future, one member the gang of bullies that Marty encounters wears a plastic soundboard vest. (That’s him on the left, officer. His character name was Data.) To use the vest, he presses buttons to play prerecorded sounds. He emphasizes Future-Biff’s accusation of “chicken” with a quick cluck. Though this fails the sartorial criteria, being hard plastic, as a fashion choice it does fit the punk character type for being arresting and even uncomfortable, per the Handicap Principle. There are certainly other wearable communications in the deep waters of sci-fi, so any additional examples are welcome. Next up we’ll take a look at control panels on wearables. Posted in Aliens (1986), Firefly (2002), Gattaca (1997), Wearable. Though most everyone in the audience left Minority Report with the precrime scrubber interface burned into their minds (see Chapter 5 of the book for more on that interface), the film was loaded with lots of other interfaces to consider, not the least of which were the wearable devices. There is also a basic circular display in the middle of the posterior left forearm that displays a countdown for the current mission: The time remaining before the crime that was predicted to occur should take place. The text is large white characters against a dark background. Although the translucency provides some visual challenge to the noisy background of the watch (what is that in there, a Joule heating coil? ), the jump-cut transitions of the seconds ticking by commands the user’s visual attention. On the anterior forearm there are two visual output devices: one rectangular perpetrator information (and general display?) and one amber-colored circular one we never see up close. In the beginning of the film Anderton has a man pinned to the ground and scans his eyes with a handheld Eyedentiscan device. Through retinal biometrics, the pre-offender’s identity is confirmed and sent to the rectangular display, where Anderton can confirm that the man is a citizen named Howard Marks. Checking these devices against the criteria established in the combadge writeup, it fares well. This is partially because it builds on a century of product evolution for the wristwatch. It is sartorial, bearing displays that lay flat against the skin connected to soft parts that hold them in place. They are social, being in a location other people are used to seeing similar technology. It is easy to access and use for being along the forearm. Placing different kinds of information at different spots of the body means the officer can count on body memory to access particular data, e.g. Perp info is anterior middle forearm. That saves him the cognitive load of managing modes on the device. There might be some question about accidental activation, since Anderton could be shooting the breeze with his buddies while scratching his nose and mistakenly send a dirty joke to a dispatcher, but this seems like an unlikely and uncommon enough occurrence to simply not worry about it. Using voice as the input is cinemagenic, but especially in his line of work a subvocalization input would keep him more quiet—and therefore safer— in the field. Still, voice inputs are fast and intuitive, making for fairly apposite I/O. Ideally he might have some haptic augmentation of the countdown, and audio augmentation of the info so Anderton wouldn’t have to pull his arm and attention away from the perpetrator, but as long as the information is glanceable and Anderton is merely confirming data (rather than new information), recognition is a fast enough cognitive process that this isn’t too much of a problem. All in all, not bad for a “throwaway” wearable technology. Recently I was interviewed for The Creators Project about wearable technologies for the Intel Make It Wearable Challenge, both for my (old) role as a designer and managing director at Cooper and in relation to sci-fi interfaces. In that interview I referenced a few technologies from the survey relevant to our conversation. Video is a medium constrained by time, so here on scifiinterfaces.com I hope to give the topic a more thorough consideration. This is a different sort of post than I’ve put to the blog before, more akin to the chapters from the book. This won’t be about a single movie or television show as much as it is a cross-section from many shows. What counts? Fortunately we don’t have to work too hard on this definition. The name makes it pretty clear that these are technologies worn on the body, either directly or incorporated into clothing. But there’s two edge cases that might count, but I’ll call out as specifically not wearable. Carryable technologies—like cell phones, most weapons, or even Ruby Rhod’s staff from The Fifth Element—aren’t quite the same thing. When in use, these technologies occupy one or both of the hands of its user. They also have to be holstered or manually put away when not in use. That introduces some different constraints, microinteractions, and ergonomic considerations. In contrast, wearable technologies don’t need to be fetched from storage. They’re just…there, usable at a moment’s notice. So for purposes of the sci-fi interfaces from the survey, I’m only looking at wearable technologies and not these carryable ones. Catch me soon if I’m wrong in excluding these two categories of tech from wearables, because the remainder of the writeups are based on this boundary. Even excluding these two, we’re left with quite a bit to consider, reaching almost back to the beginning of cinema. The first sci-fi film, La Voyage Dans La Lune, had nothing we’d recognize as an interface, so of course that’s off the hook. The second, Metropolis, for all of its prescience, puts technology in the furniture and walls of its Upper City, as monstrous edifices in the Lower City, or as the wicked robot Maria. But the next thing in the survey is the Buck Rogers serials from the 1930s, and there we see a few technologies that are worn. Since then, we’ve seen devices for communication, mind control, biometrics, fashion, gaming, tracking, plus a few nifty one-offs. Of course the survey is just that, the catalog of interfaces captured and documented so far. Sci-fi is vast and has continued since the book was published. If you see any missing by the time I wrap these up, please let me know. With this introduction complete, the next several posts we’ll look at several examples in details. But the first one is the big one, and that’s the Star Trek combadge.